Even though growth in the U.S. economy continues to be disappointing, nonresidential construction activity is projected to see healthy if unspectacular gains this year, with construction spending for buildings rising by 5.0 percent in 2013 before accelerating to 7.2 percent in 2014. The construction of commercial facilities is expected to lead the upturn, with spending gains of almost 9 percent this year and nearly 11 percent next year, led by double-digit gains in hotel construction. Industrial construction spending is projected to nearly match the overall nonresidential building totals this year and next, while institutional construction activity should lag behind, with modest single-digit gains over each of the next two years. Healthcare is expected to be the strongest institutional sector. 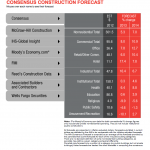 These predictions from the AIA’s Consensus Construction Forecast Panel, comprised of the nation’s leading construction forecasters, are consistent with information derived from the AIA’s Architecture Billings Index (ABI). While national ABI numbers were mixed in 2011—suggesting an uneven performance for construction in 2012—they were more uniformly positive in 2012. Eight of the 12 months of 2012 showed positive national ABI readings, including the final five months of the year. The ABI readings in the fourth quarter of 2012 were the strongest quarter since the downturn began in early 2008, suggesting that construction activity should begin to accelerate significantly in the first half of 2013. Though the national economic recovery began in mid-2009, the economy still exhibited subpar growth in 2012. Gross domestic product increased 2.6 percent between the third quarter of 2011 and the third quarter of 2012, up modestly from 1.8 percent growth in 2011 and 2.4 percent in 2010. Payroll employment gains for the year totaled almost 1.9 million nationally, better than the 1.5 million added in 2011. Construction payrolls nationally increased by an extremely modest 33,000 for the year, following a 14,000 loss in 2011. The tumultuous budget negotiations over the Congressionally imposed “fiscal cliff” took some of the steam out of the economic recovery. In December, the University of Michigan’s consumer sentiment index dropped by almost 10 points—almost 12 percent. Business sentiment also took a toll. The Conference Board Measure of CEO Confidence score for the fourth quarter of 2012 was up a bit from the third quarter, but down more than 15 percent from the first half of the year. In spite of nervousness over the federal government’s attempts to deal with fiscal issues, there is evidence that the economy entered 2013 poised for growth. A major leading economic indicator developed by the Economic Cycle Research Institute showed a healthy rebound of 1.2 percent in December following a 1.0 percent drop in November, when concern over a resolution of fiscal problems was growing. Their index reading for the first week of January showed further gains, indicating that the economy had shrugged off the concerns over the potential impasse in December. Also, rising stock prices pointed to continued profitability among U.S. businesses. In fact, after-tax corporate profits increased almost 18 percent between the third quarter of 2011 and the third quarter of 2012. Additionally, in 2012 the housing market finally began signaling a return to health. With home prices stable or increasing in most markets across the country, and with the number of distressed properties finally edging back down, major housing indicators were seeing solid growth. Between the fourth quarter of 2011 and the fourth quarter of 2012, sales of new homes increased almost 9 percent, existing home sales were up almost 11 percent, and housing starts up almost 30 percent. The consensus is that housing starts will continue to see healthy gains. According to major forecasters, starts should increase another 25 to 30 percent this year, reaching almost one million units, with comparable gains in 2014 pushing starts close to 1.3 million units for that year. However, more challenges are ahead for the economy. The federal government’s resolution of the fiscal cliff was partial at best: The automatic cuts to federal spending—$109 billion in sequestration for the current fiscal year— were merely delayed two months. This uncertainty has already had an impact on design and construction activity. More than one out of nine architecture firms nationally indicated that the ongoing uncertainly over federal budget and debt issues had caused significant delays or cancellations of active projects at their firms. An additional 27 percent indicated that this situation was a major concern of clients, and may yet cause more delays or cancellations of projects. Last year was an uneven period for construction activity. The unusually warm winter in most parts of the country got the year off to a strong start, but activity flattened out after the first quarter. Compared to November 2011, spending in November 2012 showed an increase for most commercial sectors, paced by a 22 percent increase in spending for hotel construction. Spending on manufacturing facilities was up almost 5 percent, while spending on institutional buildings (including healthcare, education, religious, public safety, and amusement and recreation) was uniformly negative. However, recent ABI scores point to improved spending levels across all major construction sectors. Firms that specialize in residential, commercial/industrial, or institutional facilities all reported positive ABI scores in the fourth quarter of 2012, with particularly strong scores among firms specializing in the residential or commercial/industrial markets. Regional ABI scores were also generally positive. Firms in the Northeast and Midwest reported strong growth in the fourth quarter, firms in the South had moderate growth, and firms in the West reported essentially flat business conditions. With stronger revenue overall in 2012, architecture firms have begun a recovery process. Fully half of firms nationally reported increases in gross revenue of at least 5 percent in 2012, while only 28 percent reported declines. The remaining 22 percent reported stable levels of revenue for the year. This level of revenue gain was enough to encourage some firms to add new staff. Nationally, architecture firms added approximately 2,500 payroll positions in 2012, the first year for payroll gains since 2007. This year, architecture firms are expecting gross revenue to increase by about 3 percent on average. Almost half (45 percent) of firms are expecting revenue growth, 20 percent are projecting revenue declines, and 35 percent expect that revenue will be similar to 2012 levels. By specialization, residential firms are the most optimistic, expecting average revenue growth of 3.5 percent. 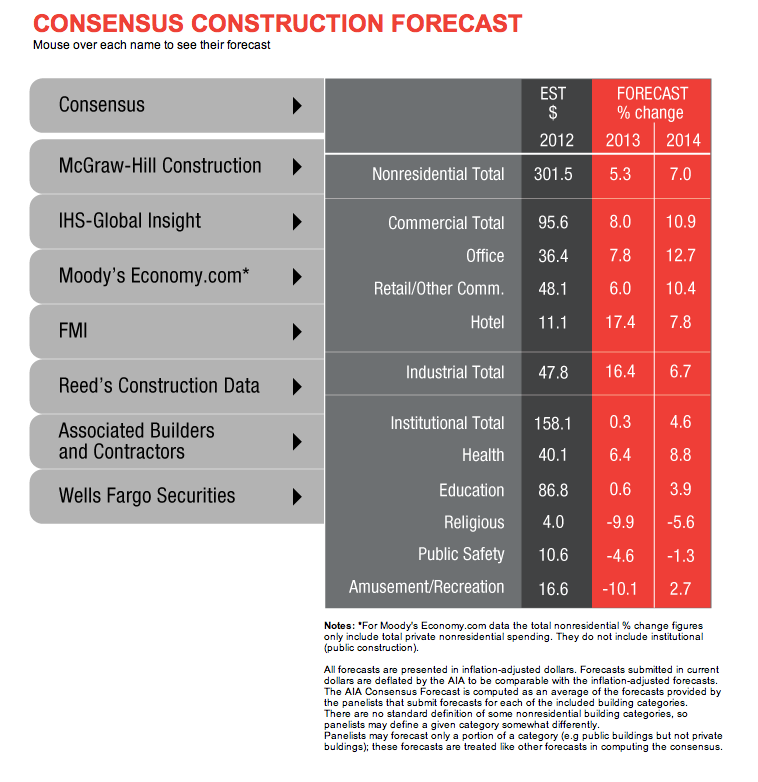 The AIA Consensus Construction Forecast panelists are a bit more optimistic than architecture firms in terms of projected revenue growth. They expect the $300 billion in spending for nonresidential structures to increase 5 percent, to about $315 billion in 2013. By 2014, they expect this level to increase another 7.2 percent, or $340 billion. While this is a reasonably healthy growth rate, that level of construction activity is still below the $377 billion average in nonresidential construction spending seen over the past decade. Commercial facilities are expected to see the strongest growth this year and next. Growth is projected at just below 9 percent in 2013 and an additional 11 percent in 2014. That would bring commercial construction levels to almost $115 billion by the end of next year, which is still more than 10 percent below the average of the past decade. Hotel construction is expected to see strong growth this year and next, and both office and retail construction are projected to see growth averaging almost 10 percent per year. Industrial construction should see reasonably healthy growth over the next two years, but nowhere near the almost 20 percent increase realized in 2012. Many companies are seeing the benefits of having manufacturing production facilities closer to home, particularly for products that have longer production lead times with offshore manufacturing. Construction increases are expected to be in the mid-single-digit range for the next two years, bringing industrial construction activity up to almost $56 billion by the end of next year. Institutional construction spending growth tends to lag behind commercial and industrial activity both on the downside and upside. Spending increased very modestly in this category in 2012, and is projected to continue to see modest gains in 2013. By 2014, the pace of construction is expected to accelerate a bit more, growing by almost 5 percent that year. The strongest institutional sector for projected growth over the next two years is healthcare. Education, which traditionally accounts for about 40 percent of the institutional category, is expected to grow at about the same pace as the overall institutional category.